World of Wellesley (WOW) President Michelle Chalmers addressed the Rotary Club of Wellesley last Tuesday night as part of a developing mission to unify the resources of Wellesley’s many civic groups. 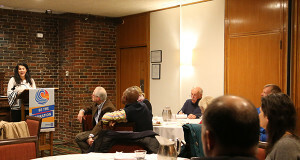 Chalmers reached out to Rotary treasurer John Adams to coordinate the speech, and used the hour-long meeting as an opportunity to introduce World of Wellesley to the Rotary Club and share some upcoming initiatives with the group. World of Wellesley was founded in 1990 after Boston Celtics player and Wellesley resident Dee Brown was misidentified as a bank robbery suspect, and was put to the pavement with guns drawn and publicly arrested by local police. Brown was exonerated – the first-round draft pick was not the black male who had robbed a South Shore Bank – but the incident sparked introspection and discussion among Wellesley residents about the inclusivity of their community. The Brown incident and aftermath inspired a woman named Tere Tedesco to found World of Wellesley with the simple mission of “Making Wellesley a welcoming place for everyone.” Nearly thirty years later, the organization is running strong, organizing community conversations, book clubs, spelling bees, film screenings, musical performances, and even pushing local legislation, all with the aim of making Wellesley a welcoming place for all its residents. As a part of her goal of ongoing civic coordination, Chalmers encouraged The Rotary Club to support the World of Wellesley’s current drive to celebrate Wellesley’s original residents by doing away with Columbus Day and founding Indigenous People’s Day. Further information about World of Wellesley (WOW) can be found at www.worldofwellesley.org. Further information about the Rotary Club of Wellesley can be found at www.wellesleyrotary.org.